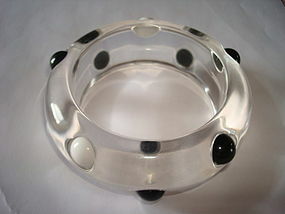 Very nice 1960's clear lucite bangle with black and white polka dots. 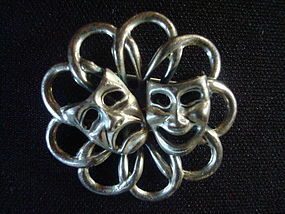 This wonderful bracelet is 1" high and 3 1/2" wide with 2 1/2" opening. This wonderful vintage bracelet is in fine condition and is sure to get you notice!!! SOLD - "THANK YOU" !! Nice Art Moderne ladies silver pin. Featuring the two classic mask of Tragedy and Comedy. This pin is signed BEAU STERLING and measures 1 3/16" in diameter. This cute pin is in very fine condition!!! $ 50.00 "SOLD - THANK YOU!! 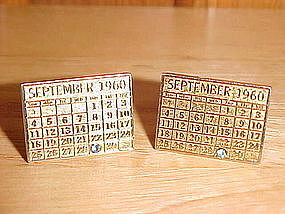 Super 1950's retro cufflinks by ANSON. They each feature the comedy and tragedy theme. 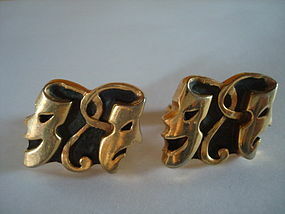 This pair of vintage cufflinks is in fine condition and measures 7/8" long and 7/8" high. They are each signed ANSON Pat Pend. This Anson interpretation of the famous Comedy and Tragedy theme is most unique and attractive!!! $ 50.00 - "SOLD" -THANK YOU !!!!! Super vintage 3 tier rhinestone and cameo brooch. 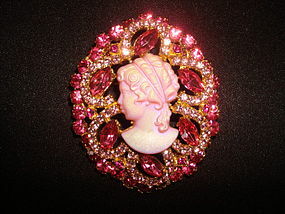 This gorgeous pin has multiple shade of pink pronged rhinestones with a iridescent pink cameo!!! This pin is in MINT CONDITION and a true SPARKLER!!! It measures 2 5/16" high and 1 7/8" wide. This pin is a true show Stopper!!! $ 30.00 - "SOLD" - THANK YOU!!! 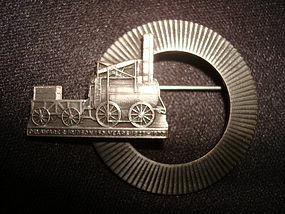 Vintage 1970's ladies brooch featuring an early Railroad Steam Engine. Under the Steam Engine it reads DELAWARE AND HUDSON 150 YEARS 1823-1973. This Railroad brooch is in fine condition and measures 1 11/16" wide and 1 5/16" high. $ 75.00 - "SOLD*- THANK YOU !! 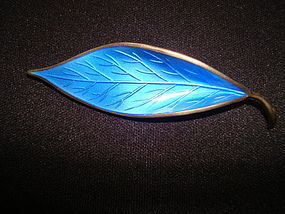 Mid century sterling silver and blue enamel Norwegian leaf brooch. 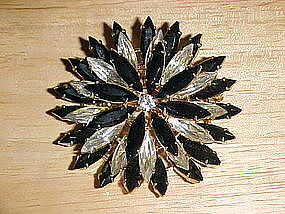 This brooch is from the famous DAVID ANDERSEN jewelry Company and designed in 1950's by WILLY WINNAESS. It is in MINT CONDITION and measures 2 11/16" long and 3/4" wide. Signed in back with scale, 929S, D A Norway Sterling, and a W (for Willy Winnaess who worked for D.A. in the 1950's). A BEAUTIFUL SCANDINAVIAN PIECE!!!! $ 35.00 - "SOLD" - THANK YOU!! 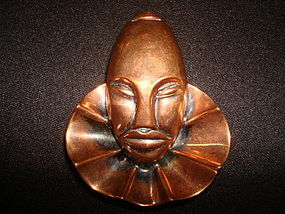 Wonderful Mid Century face mask copper brooch. This 1950's beauty is in fine condition and measures 2 3/16" high and 1 7/8" wide. The mask resembles a combination of African Tribal Mask and a clown. A real show stopper!!! $ 85.00 - "SOLD" - THANK YOU!! Super 1950's solid silver mens tie clip. 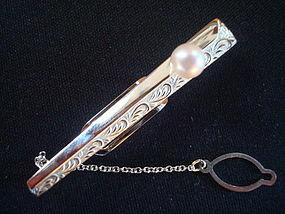 This wonderful tie clip has a genuine pearl and comes with it's original button chain. It is signed SILVER and measures 2 3/16" long. It is in MINT condition and would stand out at a Black Tie Affair!!! TOP CLASS ALL THE WAY!!! 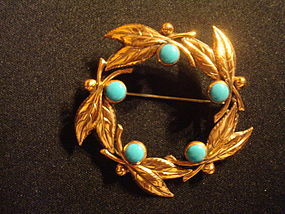 Solid copper brooch featuring a wreath of leaves with five set faux turquoise. This vintage signed COPPER BY BELL brooch is in Mint condition and measures 2 1/2" in diameter. This pin is finish in a high gloss and it is one of the finest examples of signed BELL COPPER that I ever came across. This pin would look great on denim as well as formal wear!!! $ 45.00 - "SOLD" - THANK YOU !! 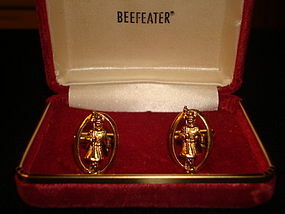 Super vintage Beefeater cufflinks with original box. Each cufflink features the famous BEEFEATER character. The Beefeater is the world renown advertising character used by Beefeater Gin. This cufflinks are in very fine condition and each measures 3/4" in height. $ 65.00 - "SOLD" - THANK YOU !! 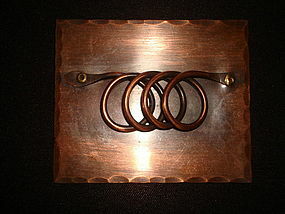 Wonderful 1950's large handcrafted brooch made of copper. This rectangle bracelet measures 3" wide and 2 1/2" in height. It has an applied spiral sculptured design. It is in fine condition with the usual minor surface scratches from years of use. This is a great piece of wearable 1950's art!!! A brooch that is sure to be notice!!! SUPER!!! Vintage 1960's crystal Intaglio Libra zodiac pendant with silver chain. This wonderful vintage pendant is signed ' CROWN TRIFARI ' and it measures 1 3/4" in diameter. It is in fine condition with a few minor blemishes that can't be seen without a magnifying glass. 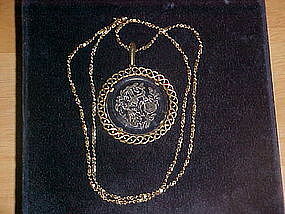 It comes with a gold washed Italian sterling silver 24" chain that is well weighted. This gem would make a fine gift for your special LIBRA!!! 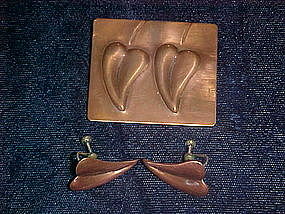 $ 70.00 - "SOLD - THANK YOU"
Beautiful 3 piece copper set by " REBAJES." The brooch measures 1 3/8" wide x 1 5/8" high and with the exemption of a tiny tiny corner bend in its upper left corner the brooch is in very fine condition. 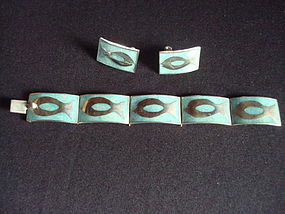 The earrings each measure 1 1/16" long and are in very fine condition. The brooch is signed " REBAJES ". This set is truely a fine example of this master artist's work. Fabulous hand crafted silver cufflinks. These cufflinks were made by a silversmith in London, England in 1970 and are hallmarked accordingly. The silversmith's initials are either JB or TB. 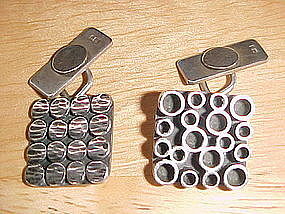 These cufflinks were crafted in the Industrial Movement Style and are in fine condition. The faces of these cufflinks each measure 3/4" square. They are quite unusual and maybe a one of a kind!!! 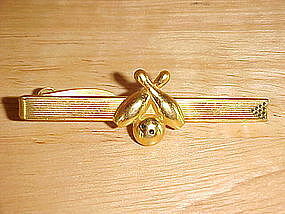 1950'S BOWLERS TIE CLIP HICKOK U.S.A. Wonderful vintage Mens tie bar. This tie bar is signed " HICKOK U.S.A " and features a bowling ball flanked by two bowling pins attached to a tie bar that is in the form of a bowling lane complete with 10 pin markers. This tie bar is in fine condition and measures 2 3/8" wide.